One of the properties required for any assessment to be credible, is that it is reliable. Roughly speaking, this property requires that the assessment would, if repeated or carried out by somebody else, give the same result. One of the difficulties with OFSTED is that, as inspections of a school are usually separated by enough of a period of time for a significant change to have happened, and no two schools are identical, it is hard to assess whether judgements differ because of genuine differences in performance or because of inconsistencies in the inspection procedure. In order to determine reliability it would be necessary to carry out two OFSTED inspections of the same school at (roughly) the same time, and see if they came to the same conclusion. Although this sort of experiment would help ensure reliability it is not something that, to my knowledge, is part of OFSTED’s quality assurance procedures. However, it was brought to my attention that something similar to this had happened recently in two cases, not as part of quality assurance but as a result of some unusual school structures. In the first of these cases, two separate OFSTED teams simultaneously inspected both Bishop Challoner Catholic Collegiate Boys School and Bishop Challoner Catholic Collegiate Girls School. Although these schools are technically separate institutions; in reality they share a building, a staff, and a governing body. In effect, two different OFSTED teams were inspecting the same set of teachers. Yet, somehow they managed to conclude that the teaching in the girls school was “Outstanding” and that in the boys school was only “Good”. These grades were also repeated in the overall judgement on the schools. The Principal and Executive Principal maintain that there is a distinct difference between Outwood Academy Portland students and others that share the sixth form centre. Inspectors found a strong ethos established by the end of Key Stage 4, by which Portland had instilled learning habits that contributed to sixth form students’ exceptional progress from having overcome often difficult circumstances in their earlier career. This sense of purpose has been established through the care, guidance and support from their teachers throughout their time in the academy. Yes, that’s right, the inspectors claim to have subdivided the students in the sixth form according to where they were in KS4, and then used this to credit one school with the quality of the education received in the sixth form by those students who had previously been in KS4 in that school. A bizarre precedent has been set for judging sixth forms by their intake, rather than what they do now. Now I should point out that I am not claiming that the judgements in these cases are wrong. The procedures may have been followed perfectly and the judgements may have some very solid foundations. What this calls into question is not the validity of the judgements, but the reliability of the procedures that have been used to reach them. If the same set of teachers can be judged “Good” by one team and “Outstanding” by another in the same day, or in the same week; then the only conclusion is that those judgements tell us little about those teachers. The difference between a “Good” sixth form and an “Outstanding” sixth form is not the quality of the teaching, or management of that sixth form. The difference between teachers who achieve “Outstanding” teaching and learning, and those who achieve “Good” teaching and learning is apparently not down to the abilities or dedication of those teachers. These reports demonstrate that OFSTED judgements are not reliable; they do not tell us about a relevant difference in quality, only differences in either circumstances or the personal inclinations of inspection teams. Apologies for the lack of blogposts recently. This has, in part, been down to a fair number of other activities and opportunities that have come up since I ceased to be anonymous (none of them in any way likely to make me any money). I’ll take this opportunity to advertise some of the things I have done/will be doing. I know this isn’t new, and my contribution is available online here, but I have written the foreword for Progressively Worse by Robert Peal. I wrote an article about Improving Teacher Quality for the Fabian Society website. My views on Performance Related Pay can be found in the online version of the Guardian today (but not the print edition) here. I will be speaking on “The Teacher As Expert” at a Teach Meet in Stafford on the 9th June. Details here (there’s still a small number of speaking slots available). I am on a panel at the La Salle Education maths conference (for both primary and secondary teachers) on the 14th June. Still a handful of free tickets available here. I should be speaking, on another panel, at the Wellington Festival of Education on the 20th June. I have written a contribution for Don’t Change the Light Bulbs, edited by Rachel Jones, which should be out in September and is available for pre-order now. I should be doing a talk on “How to have a rational argument about education” at ResearchED 2014 in London on the 6th September. Tickets and details available here. As for future projects, well … if you need a maths teacher (preferably part-time) for September, for a school in the West Midlands, please let me know. The following is from a school governor and illustrates elegantly how, in education, those who are meant to be neutral experts can be the most partisan. For reasons of anonymity, the local authority involved has not been named. I have assumed the images used are in the public domain, if anybody knows differently please let me know urgently and I will remove or edit this post. Well, teachers, you can’t have all the fun to yourselves. We school governors have to undergo training too, you know, especially so that we know what ‘critically friendly’ questions to ask you once a term. 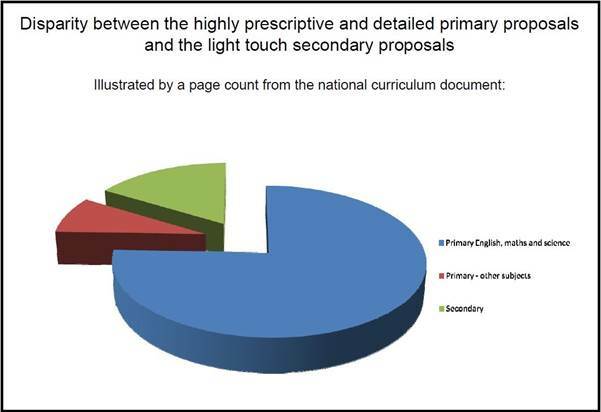 My latest experience was a local authority-run, two-hour evening session outlining the new national primary curriculum. There was a lot to pack in, so it was a fairly intense, PowerPoint-heavy evening. Let me just say up-front that the trainer was a very nice chap. In fact I spent over an hour after the training very pleasantly discussing with him some of what had been said, and it was exactly the sort of intelligent, amiable, open conversation one always hopes to have, but is all too rare. However, it would also be fair to characterise much of the training session as very negative and derisory about much of the new curriculum, and we were very much told what we should think about it; its proponent(s), and what ought to be the objectives of education in general. I took detailed notes and while some things may be paraphrased I have been careful not to distort the meaning or intended message. To enable governors to understand the background to the new national curriculum and why there are changes from the old. To discuss what your school wants to put into place, and how you intend to approach your planning into the forthcoming year. 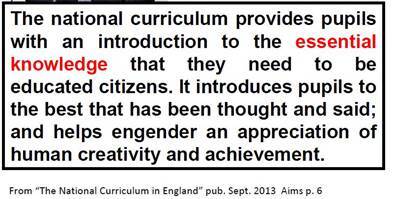 To understand how your school has already made a start on planning for the new curriculum. The trainer had E.D.Hirsch and “knowledge” in his sights from the start. 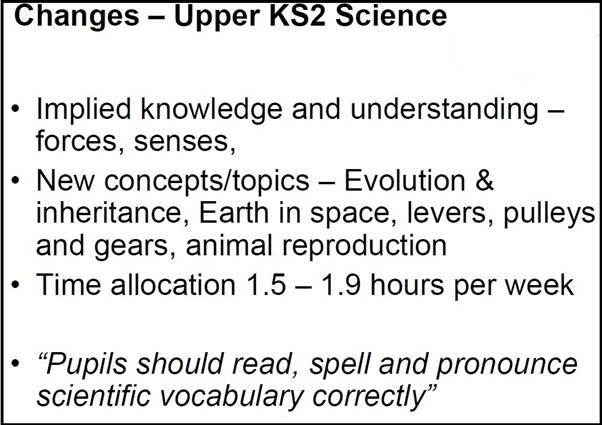 We were told about Hirsch’s Core Knowledge, and that the first draft of the new national history curriculum based on a British version of Hirsch’s model had been “laughable”. Could we, the trainer asked, remember any lessons from our own primary education? He answered the question himself with a resounding “no” (spurred on by a particularly earnest, vehemently ‘anti-Gove’ teacher/Governor among us). No, we couldn’t remember any of the ‘knowledge’ we had learned in primary school because items of knowledge were completely transient, something that we learn temporarily and then forget. The following slide, the trainer said, was the single most important message we were to take back to our fellow governors. We were to explain to our colleagues that the tree could lose all its leaves in autumn but the next spring would grow new leaves, and he explained how new knowledge was needed for each new job we might have. Should we want to be a doctor, we would acquire all the knowledge we needed for that role. Should we then wish to change career to become a lawyer, or whatever new ‘21st Century’ job came along, we would shed all the old knowledge and acquire the new set we needed. The great irony he said, was that the roots are what are important but that it is the leaves that are testable. It is unnecessary to debate whether the curriculum should only be about subjects, or whether skills are more important than subjects. The tree needs both. The roots cannot develop without the photosynthesis in the leaves, and the leaves cannot grow without the moisture from the roots. They need each other. 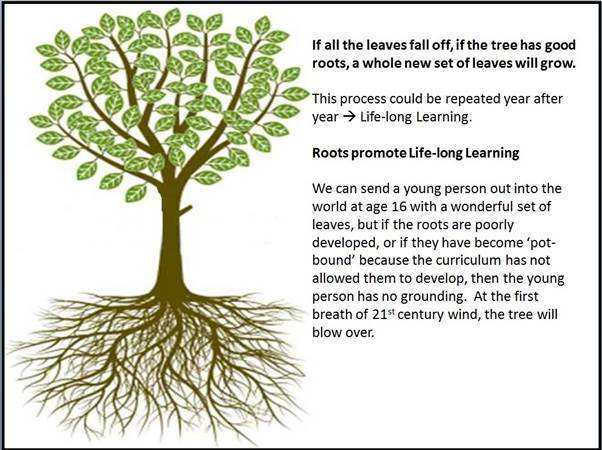 Each of the skills, competencies and attitudes at the root of learning, needs the context of leaf to develop. Children cannot learn to solve problems unless they have some problems to solve – and these problems occur within the contexts of history, geography, science, technology or any other leaves. Skills cannot be learnt within a vacuum. In conversation later, I pointed out that while I might only remember a handful of my primary school ‘lessons’, I was confident that I still had much of the knowledge I had learned at that time, and that that knowledge had enabled me to build on and learn more. I also cited the Recht and Leslie, 1988 baseball reading comprehension study, where it was found that prior knowledge had a significant positive impact on reading comprehension. The children who knew more about baseball understood the baseball-related text better than those who knew less, regardless of their actual reading ability. “Aah!” He said “that must have been of because they were more “engaged” (i.e. because they must have been more interested in baseball, they ‘related to’ and were more engaged with the task). No, I asserted, it was about prior knowledge, in fact prior knowledge facilitated ‘engagement’ because you can’t engage with a task if you don’t have sufficient prior knowledge to understand what is going on. 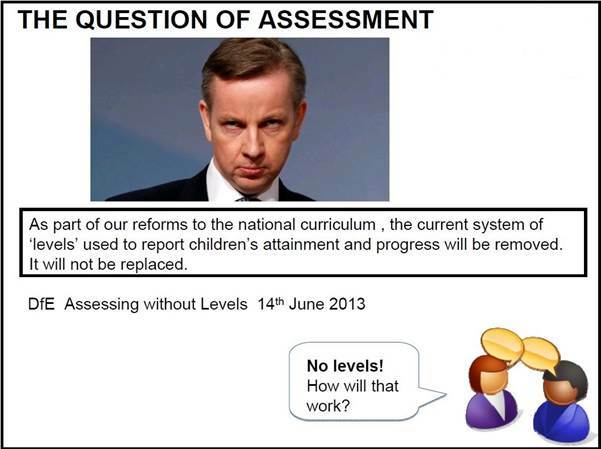 “Levels are going and not being replaced” and if this session was all about assessment “I’d scare the pants off you”. The photo selected above, while certainly amusing to many, was deliberately chosen to make a statement, and it reflected the general tone. You would have thought from the discussion that all educators everywhere had regarded the Levels system as perfect and had never had a bad word to say about it. There was some good advice, for example not rushing into replacement systems too quickly, to wait and see whether there was any further guidance, and also to see how other schools were managing. And there was also some potentially valuable discussion about what schools could do, but it was conducted in the light of ridiculing the decision, rather than seriously considering the pros and cons of ways forward. “I haven’t made this up” he laughed. With Science came the contradiction. Rather than moving younger, some topics were being left until later. Amusingly, this was also a bad idea. This time because ‘young children had really enjoyed studying those particular topics at that age’. There was also a concern that conducting “formal” experiments was being left until later in the new curriculum. It was explained that younger children would only be required to conduct ‘explorations’ not ‘experiments’. I couldn’t help but think that had it been the other way round i.e. 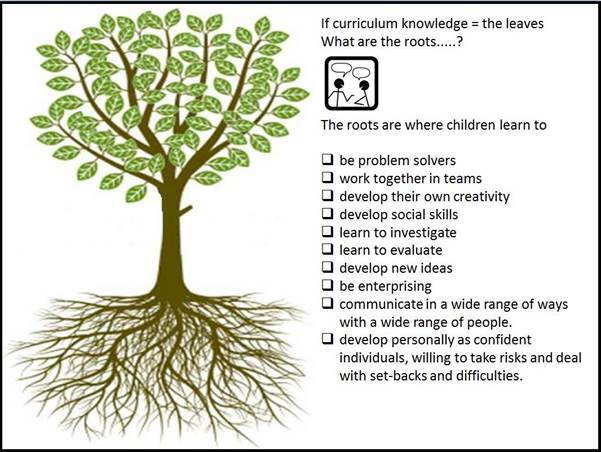 if the current curriculum had exploration, and the new curriculum was demanding more formal experimentation, we would have heard that the children were too young for ‘formal’ work. What were the problems here, asked the trainer, drawing our attention to ‘evolution’. “It’s teaching RE!” exclaimed our earnest ant-Goveite, “Yes!” he agreed heartily. He explained we can’t teach evolution in case it is against the religious beliefs of some of the children. He gave ‘Muslim children’ as an example of those who couldn’t be taught such things in Y6. And ‘inheritance’? Well that couldn’t be taught because an adopted child might realise they were adopted because of their and their parents’ eye colour. My impression from governor training sessions is that many trainers are very keen to tell us what to think. The previous course I attended was very similar, the trainer laid out her ‘philosophy’ from the beginning and provided us with unsupported, unreferenced ‘facts’ and diagrams to prove her point of view. This isn’t an approach I take to terribly well. I do think we are old enough by now to be presented with “the facts” as objectively as possible and be left to draw our own conclusions. The trainer is absolutely entitled to think what he likes about Gove, education policy, pedagogy, the national curriculum etc. However, as governors, we needed to have a run through of the main changes, including a heads-up of any contentious issues, but without the ideologically based opinion and derision; he didn’t once mention evidence. We needed guidance as to our role as governors ; what questions should we be asking of the Headteacher and SMT; what sort of answers should we get. Instead we were told to go back to our colleagues and tell them that knowledge was akin to the temporary leaves on a tree. You are currently browsing the Scenes From The Battleground blog archives for May, 2014.